The equine distal limb is a complex part of the anatomy of the horse. There is a lot going on in a small space, and a lot of things can go wrong which can impact the overall health, performance and even the life of the horse. 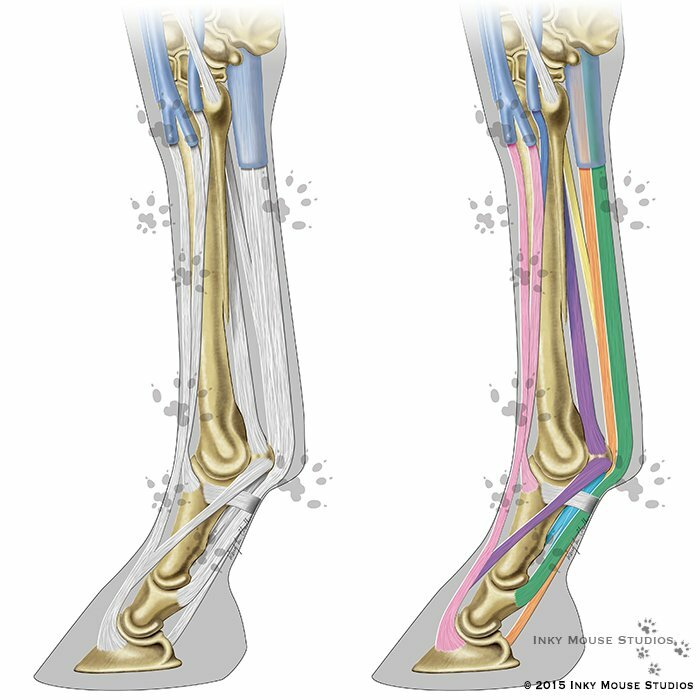 This colorized veterinary illustration of the equine distal limb is great for educational purposes – either in the classroom as a powerpoint graphic, in an anatomical wall poster or in a magazine article to help educate the viewer and direct their attention to the anatomical structures you want to focus on. The essential anatomical structures have been included, from the skeletal elements to the basic ligaments and tendons, without a lot of extra detail that may cause confusion or distract the viewer from the main focus of your article or presentation. The colorization can be customized to only highlight specific structures, in any color you want. All material © 2018 Inky Mouse Studios. All rights reserved.